Changes in ski equipment can improve a woman’s skiing, radically and quickly. The goal is not to produce a woman who skis like a man – it is simply to produce a better skier. The ability to ski is related to a combination of time spent on skis, physical conditioning, lessons, ambition, and up-to-date equipment. All these aspects are necessary components for attaining excellence in the sport. A woman can be just as ambitious as a man, spend as many hours training, receive the same quality of coaching, and still not ski well. Now with Jeannie Thoren’s recommended equipment modification for women skiers we’re all on equal terms on the same slopes together. Physically, women are NOT the average male; they don’t ski like men. They experience problems with their equipment that their male counterparts don’t. The only way to find out if your equipment is holding you back is to experiment with it. Instead of looking at it as venturing into the unknown, look at it as an opportunity to minimize your imperfections and maximize your physical attributes. Through experimentation you will find out exactly what makes you feel in control in any skiing condition. You have nothing to lose and everything to gain. Ever been told to get forward on your skis, bend your knees or bend at the waist? Do you tend to fall on your hip or rear instead of head, find ski tails sliding out accelerating as if they had a mind of their own or do ski tips tend to wander and cross? Most women skiers experience these problems. There are logical reasons for this. It is NOT because they are not trying hard enough. The changes made to the ski equipment have nothing to do with psychology, but have everything to do with anatomy. The following information wiil explain to women and to the men who would like to help, how. 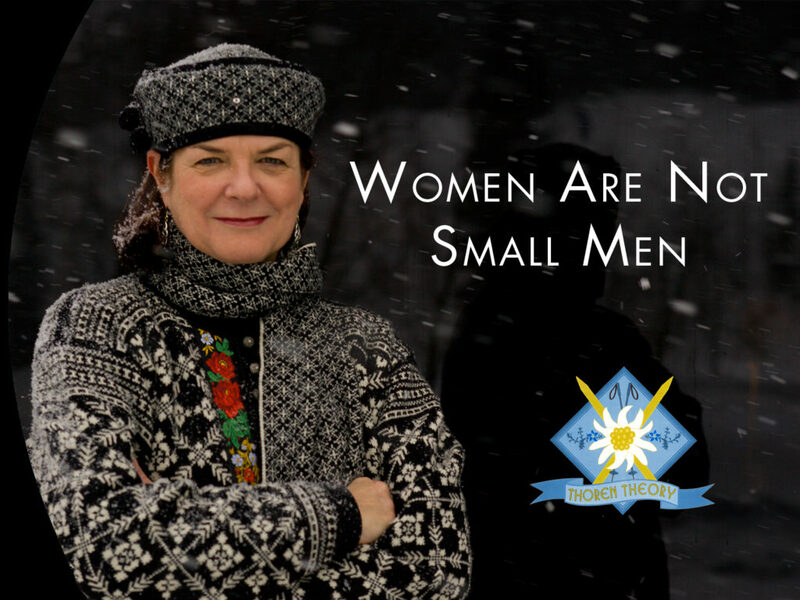 Women are not small men. They are not better, not worse, just different. How do these differences relate to skiing? of the ski. A woman “on top of her skis” can make smoother, quicker, and more controlled turns. A woman’s center of gravity is on average one inch lower and further back than a man’s. She also carries more weight below the waist; around her hips, buttocks, and thighs. Men, broader in the chest and shoulders, carry their weight above the waist. This difference in anatomy accounts for a woman carrying her weight further back on her skis. You can think of a man as a pear standing on its head, and a woman as a pear sitting on its bottom. When a man flexes forward on his skis, his center of gravity is over his toes. When a woman flexes forward, her center of gravity is over her heels. Skis initiate turns from the front end of the skis, so when a skier’s weight is concentrated too far back on the ski, the unweighted tip will shoot forward, wander, and possibly cross. Many women have difficulty getting forward on their skis and staying there. A greater “Q” Angle can cause a knock-kneed stance on skis. This knock-kneed stance stresses the knee. The structural supports of the knee, the ligaments and tendons, are stretched on the insides and pinched on the outsides. The combination of wider hips and knock-knees coupled with a woman’s greater flexibility causes the knee to be more mobile and to turn in even more. This means her skis are not flat on the snow, but are always on the inside edges. She will tend to catch edges when running straight on cat tracks, and her skis will behave erratically in a turn. A more serious effect of this biomechanical structural difference is the increased probability of knee injury. Foot Beds or orthotics are necessary to align the foot properly in the boot and especially helpful for women with foot problems such as pronation. Orthotics can also reduce some stress to the knee. After properly stabilizing the foot, canting can be addressed. Jeannie Thoren, named into Skiing for Women’s First Ski Hall of Fame, has been in the ski equipment alignment business now for the last 30 years, when she had 3 degree cants installed on her skis at Jackson Hole. She was shocked to instantly ride a flat ski for the first time in her life. It was also disheartening as she had wished her coaches had known her problem when she was on the ’64 Jr. National Team seven years previously. Thoren has been sharing her expertise and solving the problems of other women skiers since 1980. Since the hips can stay centered over the ski, the ski remains carving instead of sliding away. Control of the ski is achieved throughout the whole turn, from tip to tail. The problem of sliding tails is eliminated, as well as that annoying stem that can creep into a woman’s turns. A common problem among women skiers is bending at the waist. The biomechanical reason for this is, oddly enough, centered in the knees and ankles. Recent Canadian studies have shown that women do not bend at the ankles and knees as far forward as a man. She also has less total ankle strength. It is more difficult for a woman to “get forward” and flex her knees and ankles as far as the average male. To compensate, she bends at the waist to bring enough weight forward to control the tips of the ski to make the ski behave. The problem becomes worse on steeper slopes. In a skiing position the female approaches her maximum strength more rapidly than the male as the slope increases, and reaches her limit at a 20 – degree slope. This means ankle and knee flex alone cannot bring enough weight to the tips of the skis to initiate a turn properly. There is a very simple solution to this problem – a forward binding position on the skis, and heel lifts in the boots. Heel lifts tip the pelvis forward and establish a natural stance of greater stability. The center of gravity is moved slightly forward. Since the heel is higher, a greater amount of forward torque can be generated by the woman with less forced ankle and knee flex. This helps the woman skier keep pressure on the forward part of the ski much more efficiently, especially on steeper slopes, without having to bend at the waist. A positive side effect of using heel lifts is a better ski boot fit. A woman can control the ski far better if she is in the proper biomechanical position to do so. Often the woman has insufficient power to exert the torque needed to start a turn, so she swings her hips to get the ski to come around. But hip swing causes over-rotation forcing the tails of her skis to slide out from under her. This results in a skidded instead of a carved turn. Moving bindings forward can alleviate the problem of over-rotation. When the woman is standing in the proper position on the ski, less raw strength is needed to make the ski turn. Fewer exaggerated body movements are needed. The woman can flow into a turn instead of forcing the turn. Cants have long been used to correct leg alignment. Cants are simply a mechanical means used to level someone’s body. You can think of it as putting matchbooks under a tippy table. Good intentions don’t get a knock-kneed woman’s knees apart, cants do. Those installed between the skis and bindings are generally more effective than cants integrated in the boot. Women with radical alignment problems (like Thoren) may need both orthotics and cants. Cants are like glasses; if you need them you need them; if you don’t you don’t. The need for cants is a biomechanical fact, not a crutch. The wider pelvis and greater “Q” Angle can generate other problems for the woman skier. When she skis she must shift her pelvis more in order to keep her center of gravity over her weight bearing foot. As a result, there is greater hip movement. Women are also not as powerful as men. The average female, because of her smaller size, works at a higher proportion of her maximum strength than does the average male in the same skiing position. This is true of all joints and muscles, but is particularly noticeable at the hip. Copyright © 2019 Jeannie Thoren. Powered by WordPress. Theme: Spacious by ThemeGrill.